It may not happen often but when it does, you better be prepared. It's a formal event and the invitation says proper attire only. Don't fret, that just means that it's time for you to get yourself a mens Tuxedo. Mens tuxedos are the only choice for formal wear for men. While ladies can wear any number of style gowns and dresses, for men you simply have to keep it in the world of Mens Tuxedos. Mens tuxedos these days are basically a mens suit that is usually black but can be either white or off white that has satin lapels, covered buttons and satin stripe trim going down the leg of the pants. They come in a number of styles from your single breasted models with either 1,2, or 3 button jackets. Tuxedos can be had in double breasted models as well as a shawl collar jacket which has a rounded lapel style without notch or peaks on it. Mens tuxedos originated in England as the Dinner Jacket for men and the name tuxedo originates from the Tuxedo Park Club of New York in the 1880s originally worn by the Prince of Wales when he instructed one of his dinner guests to don a dinner jacket from Henry Poole & Co of London. When he wore the dinner jacket it became a huge hit at the Tuxedo Park Club and everyone started wearing them for dinner. Even though it was a dinner jacket, the name Tuxedo stuck. Back in those days there were very strict rules on how the proper gentleman dressed for dinner. You didn't get into a club if you were adorned incorrectly so it was important that if the invitation said Black Tie, you were wearing a Mens Tuxedo and that was that. When you need a tuxedo vest, our huge selection of mens satin vests are the perfect way to go when Formal Wear is the what you need to wear for the evening. Satin Vests come in many colors to match your Dates Dress. When shiny is the word of the day, there are mens satin dress shirts to make it a reality. 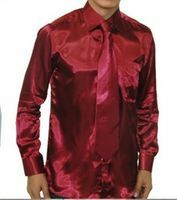 Satin shirts are great for people who are entertainers and even for you average guys who want something different to wear with a tuxedo. Try a few colors of these mens shiny dress shirts and you will be a believer. If you're wearing a tuxedo you're going to need to wear Tuxedo Shoes. 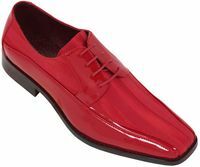 At ContempoSuits.com, we have Tuxedo shoes in practically every color you could want to match your satin dress shirts and satin vests which will make you stop the crowd. Don't ruin a great evening wearing shoes that don't belong with your Tuxedo.